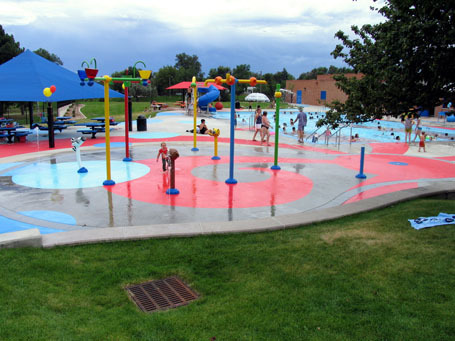 In 2010, the Barnum Park swimming pool underwent a $1.2 million makeover through the Better Denver Bond program which revamped the facility to create a more inviting, colorful and fun-filled amenity for Denver families. Two new splash pad areas were constructed with age appropriate play elements. This urban splash pad has interactive water play features and is divided into two circus-themed areas – one for 2-5 year olds and one for 5-12 year olds. Interactive play feature such as zebra, lion, and elephant cannons, large features with sprays and tipping buckets as well as choreographed dancing water streams. Other improvements included the addition of a waterslide, a new finish and a new pool deck to the existing lap pool and the addition of a rooster spray jet and a new finish to the tot pool.